The store had redone the shelving since last visit, so I walked around taking peeks of what the product placement was. I couldn’t see mice spread around the store this time, but stumbled upon a shelf that promoted the exact thing I wanted to find – a red Logitech m185. It’s a simple wireless mouse that feels great in my hand, and the batter lifetime is awesome. Price? £11.99, down from £14.99. I couldn’t immediately peek other mouses but I wanted to check if the mouse was a good deal, so I peeked around and found the actual mouse shelf at the other end of the shelf. The setup felt confusing with no price labels placed near any of the product packages, until I realized there was a display with demo units on top of the shelf, with prices. The way the demo shelf had been placed made it hard to spot, so I suspect it was a failed adaptation of the original demo shelf design to fit that particular shop. And of course, not all units were being displayed. To make things interesting, the same red m185 was also being sold on this shelf. Price? £9.99, down from £12.99. Dafuq? Good news was, £9.99 is what I had to pay. I’d again already committed to the higher price, so Currys lost £2 on my transaction. Their loss, and confirms my view on the chain being mismanaged. Maybe Browett can get his job back at Currys, and apply his new Apple knowledge to fix things. This entry was posted in Apple on January 7, 2013 by Sulka. I’ve been looking at 3D printing for a couple years pretty closely, as a result of being a co-founder at MakieLab. We at MakieLab strongly believe that the tech has come of age, where it’s possible to create consumer facing 3D printed products and are proving that with Makies. Having said that, I don’t believe creating completely new products that play on the tech’s unique advantages is the only thing that’ll disrupt industries in the near future. I read an AWESOME piece last year about a dad repairing a Bugaboo pram with a 3D printed piece. That story embodies what I believe will be a significant disruption in not too distant future – the change in logistics of providing spare parts. 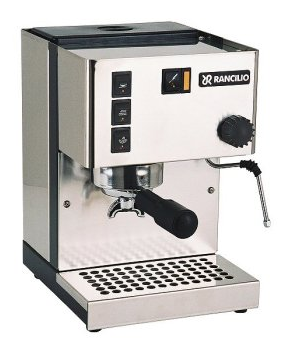 Rather than a manufacturer making significant amount of parts to supply repair centers globally, than those shops needing to stock parts, the supplying of parts could in some cases be switched to a model where the original manufacturer supplies 3D models of spares to 3D print shops, who then manufacture parts locally, on demand. While the price of manufacturing individual parts would go up, I wouldn’t be surprised if the consumer price ended up being cheaper than now, as there’d be no wastage and warehousing. What lead to this post is – we recently moved to London (!). 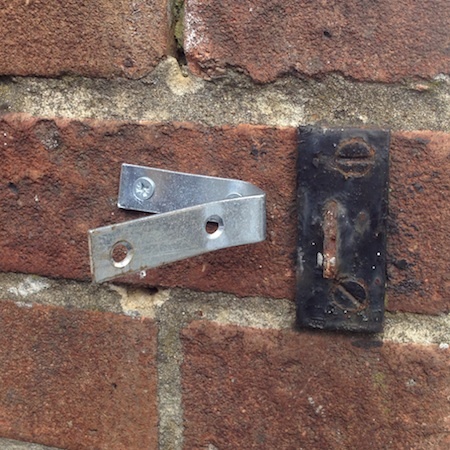 The gate to the house we’re renting was broken – the counterpart to the metal latch had broken off, and had been fixed by bolting a piece of metal in it’s place that didn’t really help with the gate. I contemplated several fixes on it before remembering Bubaboo story, and realized I can manufacture my own solution! MakieLab has MakerBot Replicators at the office, and I’ve been printing bits and bobs with them. Quick measuring of the latch positions relative to the wall and I was off to model something about 40m high using TinkerCad, my 3D modelling software of choice for simple 3D printed parts. The part took about an hour to print on the MakerBot, after which I had a spare part for the gate! Drilling out the old metal bit was super fast while detaching the new “fix” will require a new drill bit that’ll drill into the hard screws. Bit of drilling for holes, attaching and the gate was suddenly fixed. 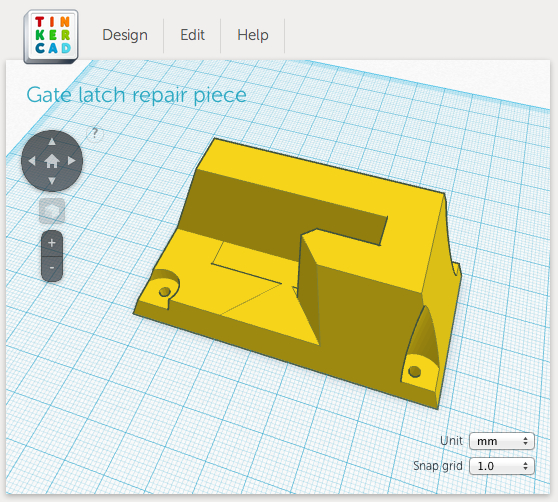 You can view and download the piece from TinkerCad, in case you have a gate to fix. :) If you print this (or other piece that require durability), I recommend using 2 shells and 100% object fill in ReplicatorG parameters. It’ll make the item print slower, but does wonders to how much punishment the item can take. 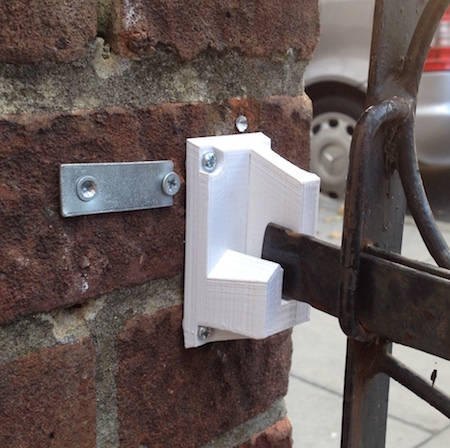 This entry was posted in 3D printing on November 4, 2012 by Sulka. John Gruber is wondering if hiring John Browett, their new head of retail, was a terrible mistake for Apple. I was certain it was, the day his hire was announced. Why? I’d just visited London Apple Store, and Currys, an electronics retail chain I believe he managed as part of Dixons. The difference between the experiences was stark. At the Apple Store, three employees came to ask me if they could help me in any way. The one that I had a discussion with was helpful and knowledgeable, and by problem was sorted – I got Lion on a USB stick to recover my laptop. The atmosphere of the store was also pleasant, so I strolled around and admired the architecture to the point where I had to later come in again and show the place around to my wife on a subsequent trip. Three floor high glass staircases FTW! Now, I went to Currys to purchase a wireless travel mouse. Nobody at any point asked if they could be of assistance. One clerk was sitting bored behind the counter, two guys who looked like they might have been working there were too busy talking to each other to care about me. The mouses were spread to three separate locations in the store, making comparison between the devices super hard – they had on promotional location for Microsoft products, one location for cheap junk being offloaded from the store and then the actual shelf for mouses. On the mouse shelf, none of the price labels were positioned next to where the mouses actually were, and it seemed about a third of the devices were missing pricing information. After deciphering the shelf puzzle for five minutes, I noticed a simple Logitech travel mouse was on a discount from ~£20 to ~$15. Great, just what I was looking for, and on sale, too! Strangely it was hidden on the floor level shelf away from the discount label, so maybe Currys didn’t want me to pick it up. Next I go to the counter where the bored dude takes mouse and scans it. The actual price for the mouse? Around £10, one third off from the price I’d already committed to! I confirmed if that really is the price and the clerk said yes, it’s on discount. I can’t understand how any manager anywhere can think it’s a good idea to have a discount on a product without telling your customers, but that’s what Currys did. Not only were they probably losing sales due to people not knowing about the discount, but also losing profit due to undercharging the people who did purchase the mouse. Needless to say I have no wish to return to the store unless I absolutely need something, and can’t order online, which is incredibly cheap and fast in London. If Currys is the yardstick for what future Apple shopping experience looks like, their retail is doomed. This entry was posted in Apple on August 17, 2012 by Sulka. When Apple originally announced phasing out device-specific UDID API, I proposed they instead do a change in what the UDID call returns which would provide privacy for users and tracking for developers: generate the UDID based on the application bundle ID and device UDID, in a manner where if the user deletes and reinstalls an application, the UDID would not change. However, as the ID would be unique to each application, tracking user behaviour across applications would not be possible unless the user identified himself in a manner that’s shareable, at which point the user should understand cross-application tracking is possible. Also, for certain uses, like banning device IDs of game cheaters, would be possible with this API change. This entry was posted in Apple on June 9, 2012 by Sulka. Our investors are great, too. LifeLine is superbly awesome, and I’m eagerly waiting for cunning planning meetings with Nikolaj from SunStone. Daniel James is a dear old friend I’m superbly grateful for him being on board. Cedric’s knowledge of anime and manga will be incredibly useful in the future. Matthew knows everything about mobile we could ever wish to know. You can read about this in TechCrunch and GigaOM. London and Helsinki, June 7, 2012. Smart toys company MakieLab announces the open alpha launch of MAKIES, the first ever user-designed, 3D-printed action doll. On http://makie.me customers are designing and sharing digital avatars that are brought to life via 3D-printshops across London. Together with the launch, MakieLab announce their seed round investment of $1.4 million. The round is led by early-stage investors Lifeline Ventures and Sunstone Capital and is joined by Anime and gaming industry veterans Matthew Wiggins, Daniel James and Cedric Littardi of superangel-fund Ynnis Ventures. “The toys industry is ripe for disruption and 3D printing opens up for a powerful blend of digital and physical. We’re thrilled to support Alice, Jo, Sulka, Luke and team in London and Helsinki in their venture to define a new toys company,” says Petteri Koponen, Partner at Lifeline Ventures. “MAKIES are great proof of how 3D printing will impact our everyday life in so many subtle ways. My daughter is already saving her pocket money for a MAKIE and for her and her peers this physical customization will be the norm,” adds Nikolaj Nyholm, Partner at Sunstone Capital. MakieLab joins the ranks of culturally influential companies in the portfolio of Lifeline Ventures and Sunstone Capital – including Tinkercad, Supercell, Prezi, Gidsy, Layar and Applifier. This entry was posted in Making on June 7, 2012 by Sulka. Do you need to deal with virtual economies in your job, such as selling services or virtual goods online? Here’s a hot tip for you – the Virtual Economists’ excellent Social Games Virtual Goods & Currencies Pricing Report + Data bundle was just discounted to $199 from it’s original $699 price. I thought the original price was good value, but now it’s a steal. What’s inside? Data from 18 social games across different platforms, crunched into learnings. The titles includes the obvious popular games like Farmville and Travian, but also interesting other titles like Ninja Saga and Ravenskye City. I’ve personally played about two thirds of the games but not to the point of having gotten all the data contained inside, so the report had a few big surprises. As part of pricing items for Habbo when I was working at Sulake, one of the hot topics was how to price items. You don’t want to offer things too cheap, but then pricing items too high also makes you lose sales. The max price we ever charged for a single item (that I can remember) was 75 credits, or about 11 euros, which a lot of people thought was insanely expensive and generally all the purchasers of the item were deeply engaged big spenders. Looking at the report, the most expensive item in the list costs a whopping 650 euros! Color me shocked. 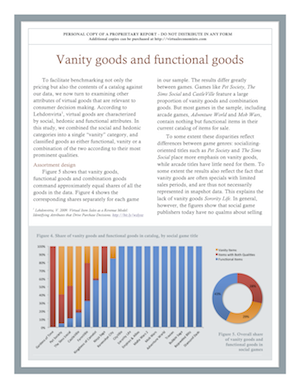 Another piece I found incredibly useful is analysis and data on the distribution of vanity vs functional items in various titles. Which one works better has been a big discussion point in the industry for years, where people seem to be segregated into the vanity and functional camps of thought. This reflects itself in the titles being analysed, where quite a few are 100% functional item driven (yay Travian) while some are very much driven by decorative vanity items. This itself is useful as a piece of data, but Vili and Eino have gone as far as analyzing the pricing differences between vanity and functional items AND how different games offer you discounts based on volume purchases. The bundle includes an excel sheet with all the original data for one’s own digging. I’ll have to remember to ask Vili if I can publish any of my own findings here. :) Anyway, go get yourself a copy of the report, so we’ll get more excellent analysis from the guys in the future. This entry was posted in Gaming and communities on May 8, 2012 by Sulka. I’ve been eyeing robot vacuums ever since the first Roomba came out, and when the nearby supermarket had a Roomba 521 on clearance, I splurged. Here’s the experiences this far. Some background – we have a dog and two small kids in a 74.5 square meter flat. What this means is, the flat goes from neat to disaster area in about a quarter of an hour, sometimes faster. And that happens every day. Enter Roomba. The kids and the dog took a few days to adjust to their new friend. Kerttu immediately named the robot wally (or wall-e) and talked to it the first couple days but then mostly lost interest. I think the dog still sometimes thinks the vacuum’s out to get her. The algorithm the robot uses to navigate floors is interesting and watching wally do his job is strangely hypnotic. I’m noticing I’m starting to learn to predict where the robot will go next, even though I don’t know how the robot works. Subconscious pattern processing is pretty amazing, I guess. I’m positively surprised at the efficiency of the robot. It’s not perfect and if I vacuumed by hand, the rooms would definitely be cleaner. On the other hand, I’m getting a 95% vacuumed flat with the touch of a button, which is completely awesome. I don’t think our floors have been this clean in a long time. To be fair, the real test for wally will be when Luna the dog starts dropping hair in a significant manner during the summer heat. If the results are as good then and the vacuum doesn’t choke, I’ll be pretty darn impressed. It’s pretty clear that in order to get real value, you need to establish a routine for clearing the floors from toys & random junk every morning and turn on the robot for daily maintenance vacuuming. This seemed a bit of an effort the first few days but I’m getting hang of the routine and I’m feeling good about the results. First, the unit we got feels noisy. I know it’s silly to assume a vacuum would be silent, but the unit looks somewhat graceful so I somehow expected it to be quieter based on the looks. I’d definitely prefer to be out of home when wally is working, but I work from home right now, so that’s unfortunately not an option every day. It does sound like half the noise is the motors though, so I’m sure the unit could be made quieter. Second, the dock supplied with the unit is just silly. The dock is super light weight and the bottom of it is slippery, so I can’t see how it’s supposed to really work. After wally failed to dock the 50th time due to the dock slipping away, I just put some two sided tape onto the bottom of the dock so it doesn’t move anymore, and the problem was solved. I suspect rubberised bottom with more friction would fix the problem, but Roomba decided to save costs and give me a cheap piece of slippery plastic instead. Firstly, I suspect the navigation system of the robots hasn’t improved hugely despite the product having been on market for a fairly long time. The robot definitely doesn’t remember the flat’s layout. Given today’s tech, I’d be very surprised if it wasn’t possible to create significantly better system that was still cheap enough to manufacture, so from this perspective it looks like Roomba is resting on their laurels, waiting for someone to come to market with a superior product and eat their lunch. Second, it feels like the product would be greatly improved by adding some more personality traits to it. The couple little quirks the robot has are great – when you activate it from the dock, the robot makes the same warning beep sound as if it was a truck, as it backs out from the dock. And apparently you get some quirky talking when you try to steer the robot with your foot a little too much. But I’d like to hear the robot tell me about how full it is. Or maybe occasionally speak out how many meters it’s traveled in the flat. A bit of Genuine People Personalities and I think I’d love the bugger a bit more. And a talking piece of kit would probably make the product more viral. Having a switch to turn off the personality might be a good idea though, with related snarky comments when you turn it back on. 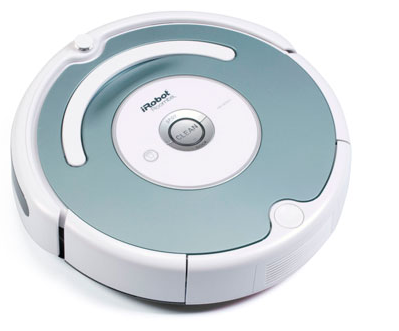 Update: I’ve been informed the current models are incredibly good compared to the Roombas that first came to market. Myself assuming they’ve not improved dramatically is a testament to how good a job Roomba has done on the robots – the current model Just Works, so the user gets an impression that creating the product must have been effortless. The truth seems to be a massive amount of iteration has happened, even if the product still looks similar to the first models that came out. This entry was posted in Uncategorized on April 11, 2012 by Sulka. When you think of what clean laundry smells like, what is the smell that comes to your mind first? I’m assuming more than half the people reading this will think of the smell of their favorite detergent, which means all those ads featuring happy women smelling laundry has been extremely successful at making people associate the smell of clean with a particular mix of chemicals. Above thought came about as I was just hanging the laundry and smelled it. What clean laundry smells like is wet cloth, an almost nonexistent but perceptible smell. And clean here means the item of clothing doesn’t have anything on it including stains and chemicals. Just water. This entry was posted in Uncategorized on April 8, 2012 by Sulka. John Gruber doesn’t like the way Readability is doing business. I have a simple proposal for fixing what they’re doing that I think would make almost everyone happy. Readability should hire someone to work full time in creating a database of who owns each site they owe money to, going through domains in order of how much money they ought to pay the owner of that domain. Once you reach the person who owns a domain, just tell them how much you’ll give once they’ll sign up. If the content publisher refuses the money, it’d be a conscious choice, not oversight due to not knowing Readability exists. There, most objections to Readability’s business gone. This entry was posted in Uncategorized on April 2, 2012 by Sulka.